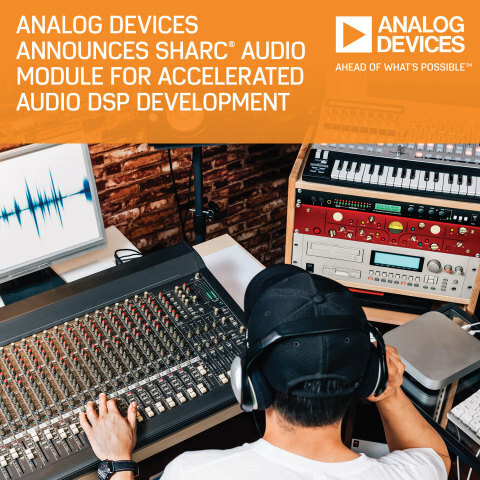 NORWOOD, Mass.--(BUSINESS WIRE)--Analog Devices, Inc. announced today the availability of the SHARC® Audio Module (ADZS-SC589-MINI), a hardware/software platform that facilitates efficient product prototyping, development, and production of a variety of digital audio products. Delivering an innovative combination of high-performance audio signal processing components and a comprehensive software development environment, the SHARC Audio Module is ideal for effects processors, multi-channel audio systems, MIDI synthesizers, and many other DSP-based audio projects. Traditional product development efforts usually require a significant investment in time and effort to select components, prototype a board, and develop a basic software structure before developers can even begin to address their own product needs. The SHARC Audio Module significantly accelerates this process by providing an audio platform integrating a wide selection of analog and digital I/O with a fundamental software package and development environment. The SHARC Audio Module can be used as a self-contained system but can also be expanded, allowing for the creation of custom I/O and control surfaces. View the SHARC Audio Module product page at https://www.analog.com/en/design-center/evaluation-hardware-and-software/evaluation-boards-kits/sharc-audio-module.html for a full description and access to support collateral. In addition to the main SHARC Audio Module, Analog Devices is also offering an expansion board called a “Fin,” which provides additional functionality. The Audio Project Fin (ADZS-AUDIOPROJECT) is a MIDI and musical instrument/FX daughter card that provides a control surface with ¼” stereo I/O, additional connectivity, and expanded signal accessibility for the SHARC Audio Module. The SHARC Audio Module allows developers to focus on their own algorithm and user interface development utilizing a compact, cost-effective, base platform with a highly optimized software and tools ecosystem. View the Audio Project Fin product page at https://www.analog.com/en/design-center/evaluation-hardware-and-software/evaluation-boards-kits/audio-project-fin.html for a full description and access to support collateral. Read and subscribe to Analog Dialogue, ADI's monthly technical journal, at: http://www.analog.com/analog-dialogue.